The Nations BEST ZZ TOP tribute act! Considered to be the most authenic ZZ TOP tribute. You won't find any fake beards here! Spinning Fuzzy guitars...yup ,we got em! Find out why Marilyn Manson guitarist Zim Zum & Los Lobos guitarist David Hildalgo endorse The Eliminator band! Greatest ZZ Top tribute around! Picking Eliminator to perform on LIVE National TV as part of The World's Greatest Tribute Bands on AXS TV was an excellent decision. Eliminator was amazing! They are on point musically and their ZZ Top choreography was spot on! The only thing more real than their beards is their professionalism. They're on time, thorough, crowd pleasing rocker dudes. A MUST BOOK BAND. Thanks, Katie the AXS TV production crew was top notch as was the Whisky A Go Go crew and you were simply delightful! Thanks for your hospitality! This Little Ole Band from Illinois totally rocked Portland, Indiana last night. We could not have asked for a better evening. These guys are a "spot on" ZZ Top tribute band. They had the fans in the palms of their hands. These guys were professional and very easy to work with. They are great people and would be a wonderful band for any event. We sure hope to have them back in Portland, Indiana again in the future. These guys played for our St Jude Rides fundraiser at Whiskerz Pub in Lacon Il and were outstanding. Great musicians wirh great personalities. We knew that they would be good but they were even better than that. What an awesome show. From load in to load out it was a great experience working with the Eliminator band! They have the look, the sound and the audience loved them! For their New Years Eve show the temperature outside was -23 degrees! But it was HOT inside! Can't wait to work with these guys again! The band performance was fantastic. They looked and sounded like ZZTop. The guys were easy to work with. They were almost rained out but weather cleared enough that they saved the day for our event. One of the best bands I've worked with in the 12 years I've been doing this. They were worth every cent. Eliminator holds an audience at Rock 'N Wheels! ELIMINATOR the country's best ZZ Top Tribute Band Rocked Addison during our Salute the Troops night at ROCK 'N WHEELS Bike and Car Show and even held the audience during the rain! I have never in my years of doing this seen a band hold an audience during a rain! Their performance was top notch and the audience loved them!!! Our festival had difficult weather...Windy and overcast....Did these guys care? No! They put on a show like 5000 folks were there. Not only was the music INCREDIBLE but these 3 guys are just super geniune and kind....Yes, I said kind! The Eliminator ZZTop Tribute had the crowd dancing & singing. Throwing cases of Cheap Sunglasses from the stage was a special treat. These guys have the moves, the guitar licks, and savvy stepping of ZZTop. Hickory NC loved them! National Blueberry Festival Performance a hit! We enjoyed working with this band from start to finish. They were very professional, and very responsive throughout the communication process. The performance was a crowd favorite and appropriate for all ages. Do not hesitate to hire this band for your festival or event. Easy to work with. Very professional. The crown loved them. Musically talented....the beards and costuming brings the extra flare!!! By far, one of the best acts! Eliminator recently performed at our dealership - I was completely blown away! Their attention to detail and professionalism impressed not only us but the entire crowd. They sounded, looked and acted like the real deal. I wish I could leave a higher than 5 star review, because they've definitely earned it. Not to mention, they arrived hours prior to their performance. Bottom line: I can't wait to hire again. These guys are the BEST ZZ tribute in America. My customers are still raving about them. Ron and the guy's knew this was the first time we ever did anything like this. Man did they put on a show. My customers are already standing in line to get tickets for our upcoming shows and I contribute that to the great show they gave us. Everyone thought that Eliminator was just like the real thing. Their sound and performance was right on. We look forward to having them back. Thanks again guys. Eliminator DELIVERED for The Milwaukee Rally! Eliminator delivered a fantastic 2 hour concert featuring all the ZZ Top hits, as well as some great deep cuts. They sound, look and move like the actual band. On behalf of Milwaukee Harley, it was a pleasure to work with Eliminator! I look forward to booking Eliminator in Wisconsin for future events. The Guys in Eliminator, are true professionals. Beyond their spot on tribute to ZZ Top, they are great people. The look, the sound, the attitude was all spot on! Even thru schedule changes and a weather challenge, they rolled with the punches and delivered the perfect performance for our event. Since our event was a school fundraiser and motorcycle ride, the guys made a point to show their support from the stage and involve a student on guitar. They bring a powerhouse, family-friendly rock and roll show! It is not a question IF we will book them again, only a question of WHEN. Eliminator Fan for LIFE! Great band. Easy to work with. I've booked a lot of tribute acts over the years and Eliminator is one of the best. This band knows how to play ZZ Top like ZZ Top. Prompt and professional. Plus, the beards are real! Now that's commitment! The band played for us at our 15th Annual Police Motorcycle Rally. They did a great job with getting the crowd into it. They had great sound and were very convincing. If you are a ZZ Top fan and are looking for a great ZZ Top cover band you have found them. Amazing Band - Great to Work With! 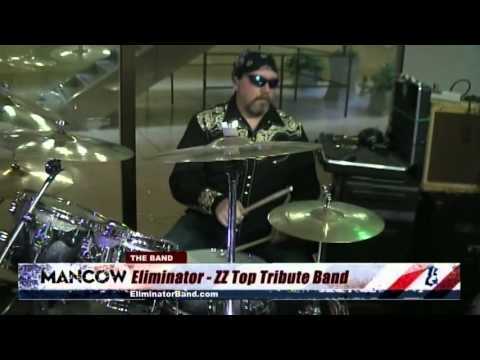 Eliminator recently debuted at one of our "Tribute Band Tuesdays" at the Owensboro Convention Center in Owensboro, KY. They were such a pleasure to work with and a truly incredible ZZ Top tribute band! We absolutely could not have been happier with their performance and professionalism! Our concert-goers were definitely impressed and had a great time. I hope to work with Eliminator again in the future! The experience I had with the Eliminator Band is one of the best parts about my event. I was able to work directly with the Band members on logistics, staging, audience participation level and special announcements. I was also able to handshake the group with sound engineers, and venue contacts for those specific needs and requirements. The band was very responsive and easy to work with as long as their plot is followed. the plot is specific enough that there was no misunderstanding. About the show - - WOW! I was blown away at the precision and quality of the sound I heard during this concert. These guys are the real deal. the city is still buzzing about this show and I am already planning how to get them back for a bigger and better show. If you have not seen ZZ TOP, you got to see the Eliminator Band. If you have seen ZZ TOP, you GOT to see the Eliminator Band. Great Band with a GREAT show - and the beards are real. Interaction with crowd was very good. Very professional easy to work with. .The crowd really loved them...got the look and the sound! Amazing band, crowd loved 'em! Awesome to work with! Could not be happier. Amazing band and even better people. The crowd loved 'em. Highly recommended. Thanks Matt, we had a blast playin! The guys put on one hell of a show , the crowd wanted more and more of the band . We are looking forward in having them return next year. The closest thing to ZZ you will ever see!! The place was packed and the Eliminator Band delivered from start to finish with the look, the swagger and the awesome sound of one of the greatest party bands of all time. And take it from me we had one hell of a party! We were pleased to find Eliminator, the Original ZZ Top Tribute, online. During the booking process, band leader Ron Schneider was professional and responsive. Our entire business experience with Eliminator was positive. The band arrived on time, worked well with our production company, and offered flexibility given the rainy weather conditions we faced that evening. Eliminator's performance was "spot on". The audienced thoroughly enjoyed the music and stayed event through light rain. We've heard nothing but positive reviews from the community and those who heard Eliminator. Working with Eliminator was one of the best entertainment experiences we have ever had in preparing for our annual fund raising event. Clear communication, professionalism above and beyond the call. They not only performed a great, spot on ZZ Top set, they became part of the event team and helped us raise more money for our charities than any of our previous efforts. I can not reccomend them highly enough. I will wear my "cheap sun glasses" proudly! Its full blown,best of ZZ Top music,done to perfection! I just saw Eliminator for the second time at The Who Else Land in Dixon Illinois this past Sat night! I didnt know which bands were playing,and i almost didnt go! When i found out i was getting to see these guys again,I was ecstatic!! I rocked EVERY song from the front row,and never left for a minuet! I grew up loving ZZ Top,and have seen them several times! ELIMINATOR IS the real deal,with an up close feel! There stage presence,dance moves,and music are better than ANY tribute band ive seen! No BS!! The Bass player,Ron,has an amazing voice just like ZZ,And the Guitar player,Bobby Z,Holy S*@#! Bobby straight on tears these licks up! Besides all that,i talked with each one after the show,and told them they were great! I also told them i was a Veteran,and the last time i saw them,i was home on leave! These guys shook my hand again,fist pumped me,and told me Thank you for your service! In closing-No ELIMINATOR,THANK YOU guys for YOUR service! Ya''ll Rock!!! Thanks Jeff, we had a blast playin there again! Professional, early to set up, and Rocked the whole night! We did a CD drive for the troops and Eliminator helped promote the event. Many deployed heroes are going to be able to rock out with all the cds we collected! Eliminator sounded BETTER than when I went to see ZZ Top Live. They were very energetic and had several changes of wardrobe. My favorite part was when they handed out cheap sunglasses to the crowd! Really Awesome Guys!!! Not only are these guys tremendously talented musicians, but they are some of the nicest guys I've met in the music biz. You gotta check out their show! Electric! 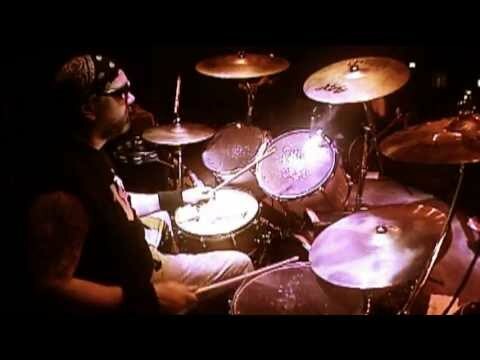 Since 1992 The Eliminator band has been impersonating That Lil Old' Band From Texas, ZZ Top! We are dedicated to giving our audience the complete ZZ Top experience. We've been told time and time again that we sound & look just like ZZ Top! ( if you put a long beard on a white guy, We All kinda look like ZZ Top don't we?) but It takes more than a store bought fake Santa beard to be a ZZ tribute band! To start with all 3 members of The Eliminator band are Diehard ZZ Top fans! 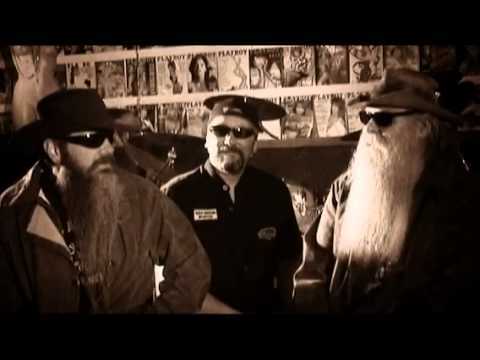 We love this music and that shows in our performance, if you are not a ZZ Top fan we know we can still entertain you and hopefully "convert" you! We throw out dozens of sunglasses at every show prior to playing the hit song " Cheap Sunglasses" , so if you get lucky you just might go hone with a pair! Stage plot & "Rider" available on request.